This website and blog are for those interested in the American Revolution. We are focused on a specific event: the June 1776 fight at Breach Inlet during the Battle of Sullivan’s Island near Charles Town (now Charleston), South Carolina. We seek to understand this nearly-forgotten battle and share the history with the public. I hope you will explore the site and offer constructive feedback and suggestions. Click on maps or other images to enlarge them for greater detail. Every page except this Home page is interactive. Simply write what you think in the Reply or Comment section at the bottom of any other page. The first time you post a comment, you will be asked to enter a name of your choice (which others will see) and your email address (which others will not see). This site presents a summary of the history and describes a small, public park at the site of the battle. To see remarks and photos from the 2011 dedication, reception, and exhibits, visit the Dedication section of this website, https://thomsonpark.wordpress.com/dedication. Text from the 2012 Carolina Day address about the Battle of Sullivan’s Island may be found here Carolina Day Remarks. The park was completed in 2012 with a final exhibit installed by our professional partners at The History Workshop, a division of Brockington and Associates. Donations help maintain and enhance the privately-funded park. If you are interested in contributing, please call or email me or send a check to the Fort Sumter – Fort Moultrie Historical Trust, 40 East Bay Street, Charleston, SC 29401. Be sure to designate your gift for Thomson Park. 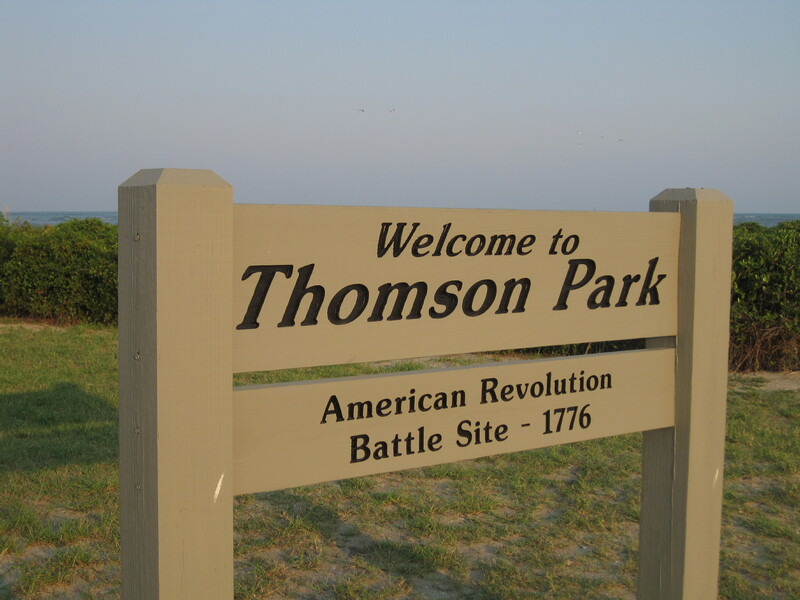 The Trust is a 501(c)(3) charitable organization that extends the reach of the National Park Service with programs and projects like Thomson Park that help preserve, protect, and utilize these historic sites for the common good. Thanks for your interest. I hope you enjoy learning about the Battle at the Breach. Click to subscribe to this blog and receive notifications of new posts by email. You can enter your address just once for the Thomson Park blog.